Thankfully, we did not sustain any damage from Hurricane Michael. Our beach is still pristine! Looking for a private beach retreat, away from the traffic, crowds & noise? Then you will love Inlet Beach Hideaway! This charming, clean & comfortable townhouse is the perfect beach getaway! Coastal Living Magazine recently rated adjoining Rosemary Beach as the '#4 Best Beach for Swimming in the U.S'...Our beach is the same as Rosemary's, with less people! It's a short driving distance to fantastic dining, night life, world-class golf courses, kid's activities and tons of great shopping! Destin, Panama City Beach, Seaside and many more great beach towns are just minutes away. Close-by places to eat include Shades, The Donut Hole, Dunkin Donuts, Waffle House, and countless others are within 5 to 10 minutes away. We provide WiFi, 3 TV's w/ Dish satellite & DVD's, 2 VCR's, 95 + movies, 3 stereos w/ CD players, (two w/ mp3), lots of books, magazines, games, puzzles, etc...A rainy day, although rare, can be fun & relaxing! You'll find everything you need in the well-equipped kitchen, and a charcoal grill is provided. We provide plenty of beach chairs & umbrellas for your use, and a beach cart to carry your things to the beach..
State of the art Grand 16 Movie Theater, day spas, nail salons, ferris wheel (coming soon) and much more! The beach across the street from Margaritaville is pet friendly. HookD by the pier allows dogs on the deck. There are walking/bike trails in Aaron Bessant park (where the amphitheater is located). Google Pier Park...It is awesome! The Panama City International Airport is less than 20 minutes away. Frank Brown Park is about 8 miles away. They have an Olympic pool, Aquatic center, tennis courts, ball & soccer fields, fishing, miles of bike & walking trails, two fenced pet play areas, activities for seniors & much more! The fishing is great & the sunsets and sunrises are to die for! My goal is to provide everything you want/need for a perfect vacation! So, come and enjoy the good life at Inlet Beach Hideaway! If you're like most, you may never want to leave! After driving from Lake Lanier in Georgia for many years to visit my place at Inlet Beach, I have decided to call the area home. I now live about eight miles away, in Panama City Beach. I have peace of mind in knowing that everything is just as it should be, so that my guests will enjoy a fantastic, relaxing vacation! Includes large pots for shrimp boil, tea kettle, coffee grinder, etc. 3 Stereo systems with CD players. Lots of board games, puzzles, cards, etc. Large open Deck off the master suite with privacy wall & fantastic gulf views! A peaceful, comfortable vacation spot....You have the feeling of being away from it all, but it is just a short drive to all the conveniences that make your vacation awesome! Can’t think of a single thing to complain about, it’s overall a great place and definitely plan to come back! Thank you so much Luke! I am glad you guys enjoyed your stay, and hope you will be returning soon! The location was great, very quiet and relaxing. Mary was very helpful and quick to resond to all questions. I am glad you found everything you needed for your two night's stay. I am sorry you feel that my place is dated. This is a bit perplexing, as the only things that have not been replaced and/or updated in the past few years are the upstairs toilets & bathtubs and the kitchen cabinets & countertops. Perhaps you guys should choose a newer property for future stays....? The ocean views from the upper balcony are gorgeous and when the ocean is active, the sounds of the waves are incredible upstairs with the patio doors open. You literally have your own private beach as we only saw half a dozen people on our stretch of sand in our 5 day stay. Mary warmly welcomed our family with cookies, popcorn and a sweet note. She has equipped the unit with everything you would need (except don't forget to bring your own beach towels) including a large variety of games and movies. We loved eating breakfast or lunch on the lower balcony, so cozy with a table, sofa & a couple of chairs and soaking up the sun on the upper balcony with 6 patio & lounge chairs. You just feel right at home in her hideaway condo. 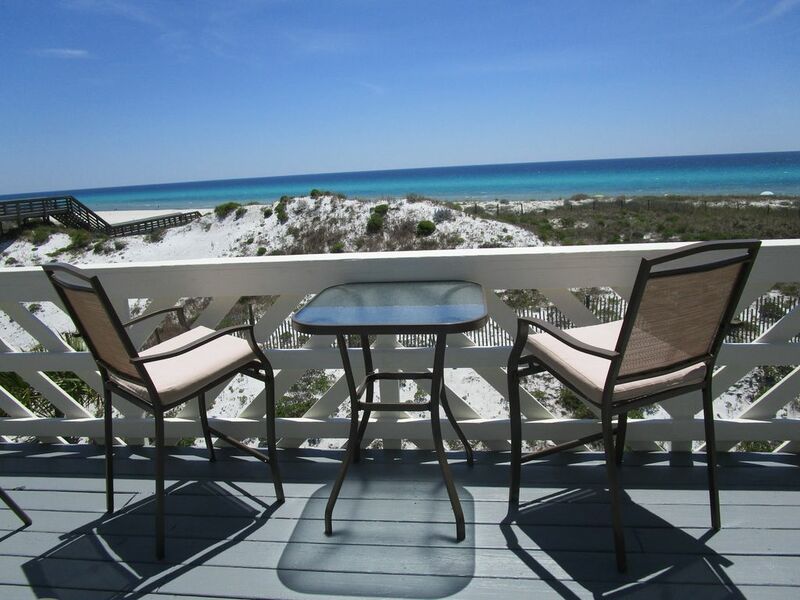 Our family loved the location on quiet Inlet Beach but so close to busy Panama City Beach or the bustling beach towns of Rosemary Beach and Seaside Beach. Highly recommend eating at La Crema (phenomenal tapas dinner & chocolate desserts) & Cowgirl Kitchen in Rosemary Beach and Bud & Alley's Restaurant & amazing shaved ice at Frost Bites food truck, both in Seaside Beach. Mary's condo is a wonderful place & we can't wait to go back! Thank you for taking time to share what you enjoyed about your stay! It was very nice having you as my guests, and I hope this was the first of many visits! As I have often said, it's nice people like you that make all my efforts worthwhile, and very rewarding! We loved staying at Inlet beach hideaway!! Thank you!! I really enjoyed having you and your family as my guests! Hoping you will return soon and often! the BEST view, Comfy too! Mary's Inlet Hideaway is charming with the best view! Sitting on the top porch each morning and watching the sun come while sipping my morning coffee was simply paradise! This cute townhouse has everything you could need for a nice beach stay. The only thing missing are YOU and the groceries! Can't wait to come back and spend more time on the porch watching the sunrise and the waves crash onto the white sand beach. Thanks Mary, for sharing your Inlet Hideaway with us! I am so glad you enjoyed your stay! I agree, those sunrises are to die for! A wonderful way to start the day! It was very nice having you guys, and I hope you will be heading back soon! Looking forward to your return visit! 20 minutes to Panama City Beach International Airport! 10 minutes to Pier Park. You must abide by your House rules and rules pertaining to pets, as spelled out in my Rental Policy. You may make a full payment with your initial payment, if you prefer.